If in 1988 you had wanted to make a movie about U2’s early years, you could’ve hired The Alarm to play them. They were Welsh, not Irish, but they were all inspired by The Clash and were intensely righteous. The Alarm sounded like U2. They sounded like U2 on the day they strummed their first note and I’ll bet they sound like U2 today. Middle-aged U2. The Alarm were good. They weren’t built for a marathon, like U2, and they weren’t able to evolve, like U2, but they could be magnificent in a sprint. Like U2. Plus the gentlemen in The Alarm had serious hair. Electric Folklore Live is The Alarm’s answer to U2’s Under a Blood Red Sky (1983). On the first three tracks they go head-to-head with U2’s legendary live album and emerge with a draw, including one first-class pop song: “Rain in the Summertime,” a bouncier version of “I Still Haven’t Found What I’m Looking For” (by, of course, U2). Sadly, Electric Folklore has three more songs, and the quality drops like a ball rolling off a table. Well, that saves time! Once you’ve played the first half of Electric Folklore Live, put that record down and go check out two other songs by The Alarm: “The Stand” and “Sold Me Down the River.” Then I recommend you go directly to the album that The Alarm failed to record but U2 did: The Joshua Tree (1987). 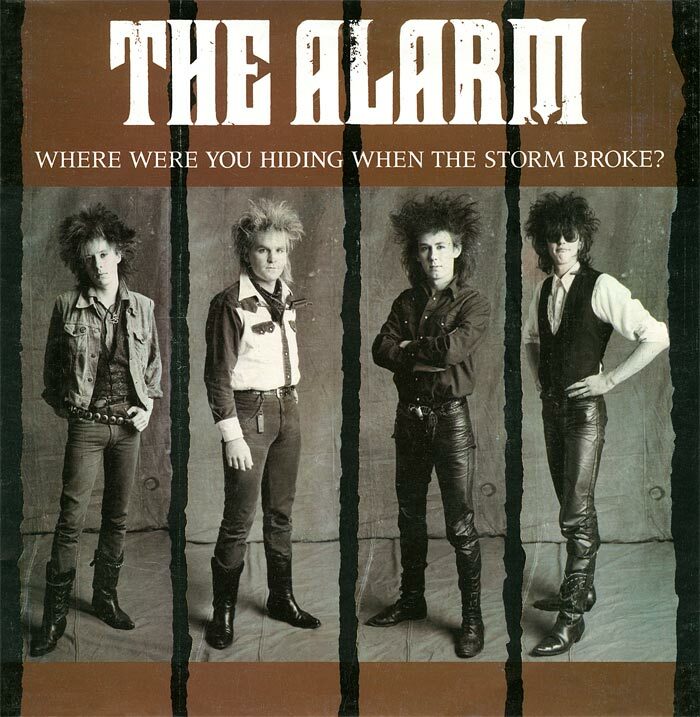 If The Alarm came to Portland and played the Oregon Zoo Amphitheatre, I would probably go. The tickets would be way cheaper than tickets to U2. If you want an artist who can whip up a mood of despair and sometimes carry a tune, Siouxsie is your girl. I enjoy these glimpses of hopelessness because I’ve spent so much of my life working in corporate America. Feeling buoyant, joyful, vivacious? Give Kaleidoscope a chance to let some of the air out of your life. John Mellencamp’s early career was a struggle. His record company changed his name to Johnny Cougar and forgot to tell him. Sorry, kid, our bad. All of his early albums feature glamour-boy photos of him as if he were David Cassidy’s smarter younger brother. Critics dismissed him for sounding like Bruce Springsteen, Tom Petty, Bob Seger, and The Rolling Stones. I refused to buy his records. How do you survive such a storm of disdain? Mellencamp can’t write as insightfully as Springsteen, Petty, etc., and thanks to my boycott he was practically living out of a cardboard box. But he was persistent. By 1983 he had managed to sneak his real name onto his albums. Critics were reconsidering his work. Even I started to like him. The song list is hard to read plus it’s in in the wrong order double plus it doesn’t mention the one song that was a hit. But then I start to play it and by the time I get to the last track I’m eager to hear the first one again. R.E.M. had an immense talent for being boring, which is why I forget them for most of the year. But it’s hard to imagine an ’80s Hall of Fame jukebox that doesn’t include at least half of what’s on this disc, including “Cuyahoga,” “Hyena,” “Begin the Begin,” and that hit I mentioned, “Superman” (the one song they didn’t write and that Stipe doesn’t sing). No Trump jokes tonight. I was making myself ill.
Predictably, I loved the Alarm! Saw them at some club on Aurora (Parkers?) in Seattle, but they didn’t have that hair, must have been a few years later. It was an intimate venue and they were terrific in it. I was even bold enough to go up afterwards and shake hands, thanking them for the show. They were very down to earth, hanging around and talking to people. They’re not U2, no, but I loved them for who they were. I can’t find the album, but they had a song done with a Welsh choir in the background that was breathtaking. Parkers was a terrific place with the biggest wooden dance floor in Seattle. It’s a sports bar now. I suspect you saw them there in the early or mid-90s. I envy you the experience, you bold thing you. Let me know when you find the song with the choir. A few years ago, the lead singer had a birthday, and U2 sang “Happy Birthday” to him! And I found their website. Apparently they’ve been very busy since I last checked in with them a few decades ago. They have a ton of albums. Thanks for digging this up, Linda! Is this the New South Wales fight song? Dig those suspenders!